P-00 (Pre-Prototype) 30 inch scale fretted 4-string. Neck-thru of Flame maple/Karelian Birch, Flamed Ash and Quilt Maple body, ebony fretboard, original custom hardware. P-01 (1st Prototype) 34 inch scale fretted 4-string. Neck-thru of Flame maple/Purpleheart, mahogany body with Bubble Quilt maple top and back, Continuous wood covers, Ebony fretboard with violet Fiber Optic side dots, Custom Chernishev humbuckers with Ebony covers. P-02 (2nd Prototype) 32 inch scale fretted 4-string. Neck-thru of Flame maple/Purpleheart, Myrtle body with Flame maple top and Flame Mahogany back, Continuous wood covers, Cocobolo fretboard, Custom Chernishev humbuckers with Ebony covers. 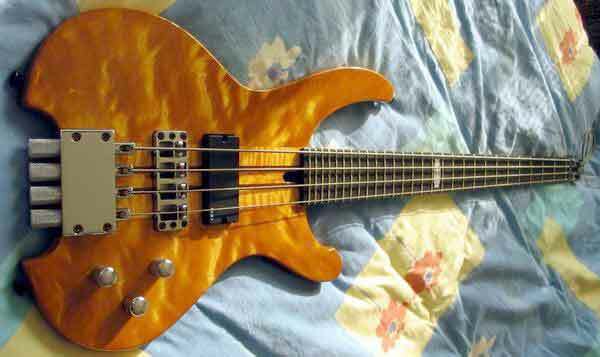 P-03 (3rd Prototype) 35 inch scale lined fretless 4-string. Neck-thru of Flame maple/Purpleheart, mahogany body with Bocote and Bubinga top, Continuous wood covers, ebony fingerboard with 3-D pearl block markers, Custom Chernishev single-coils with Ebony covers. P-05 (5th Prototype) 34 inch scale fretted 8-string (octave-strung). 7-piece Neck-thru of Flame maple/Maccassar Ebony with Vermillion accents, mahogany body with Flamed Birdseye Burl maple top and flame maple back with matching headstock facings, Continuous wood covers, 24-fret Ebony fretboard with blue Fiber Optic side dots. Chernishev custom-wound wide-range humbuckers with Ebony covers, Active EQ system. Based on an Original design by Rob Anderson. Carved, Chambered Body of Mahogany, Walnut, and flame maple. "Burgundy Violin-burst" polished nitro lacquer finish. Fretboard of premium FIGURED COCOBOLO with Mother-of-Pearl dot inlays. Truss rod cover and rear cavity covers made of AAAAA burl maple. 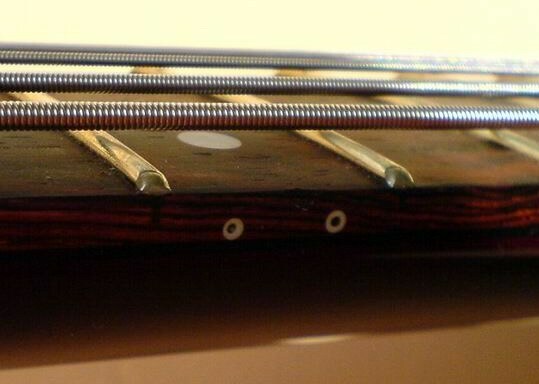 Dual truss rods for finer adjustment of playing action. Machine heads are gearless Steinberger. 32" scale length, 21 frets clear of the body. 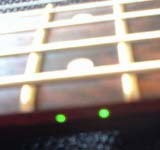 Fiber Optic Side dots that light up automatically when you plug in the instrument! Side dots have contrasting wood bezels, so they are clearly visible even when switched off. Side dots are on a completely separate battery than the Alembic electronics. (bass has two 9-Volt batteries inside the battery cavity). Battery cavity is separate from main control cavity.